I followed a link from a friend (I think maybe Adam) and let http://spectrogr.am/ do its merry work on one of my pieces, a remix collaboration with Barry Cullen. The result is very satisfying. The twin demon/alien figures on either side, the inverted goat’s head at the top. Satisfying. Try it out here: http://spectrogr.am/mysterioso/audiopaint-remix-1-master-wav. You need a SoundCloud account, and I think the spectrogr.am service may not work in Chrome. 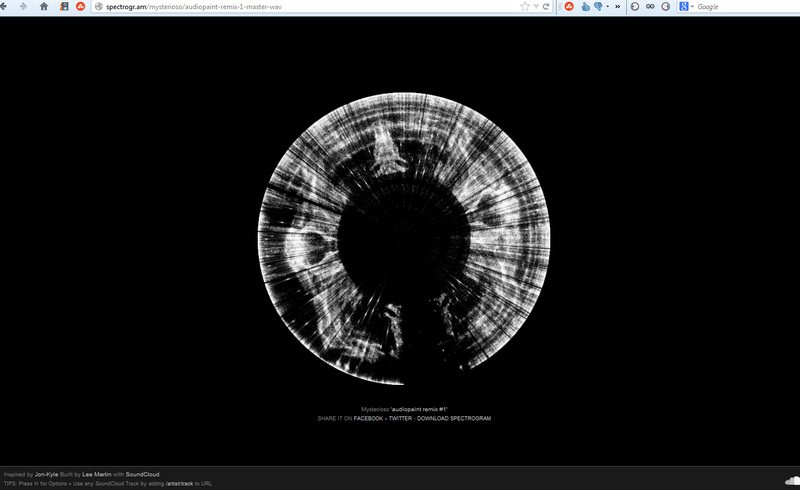 Also, I do believe Adam linked this Spectrogram shiznit. Holy bee’s dicks I have a Gravatar account?? Yo yo yo I just moved my site over to WordPress ‘cos it’s free and after a wee play with it, it is dead easy. Plus there’s an app for my phone which is better than any of the Blogger ones I’ve used. Aye, WordPress went through my emails and came up with a bunch of accounts to follow, so I just added all the folks who I didn’t think would get offended by it! I still check one of yer blogs, but how many do you have?! I have far too many blogs and some need to be deleted. For the last while I’ve been using a specific one that I think you (and maybe two or three others) follow. My gravatar name was SADFAY, that means it’s only 2011 old. I may have been verry, verry drunk when I created it. Pintage da fawk mate, like. Previous Previous post: Art in the workplace.